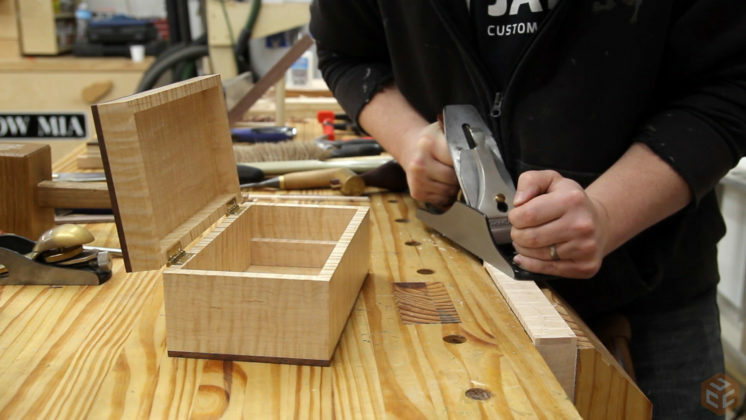 In the last video I started making four boxes that I’ll be giving to family for Christmas. I got the box structure complete and added hinges to two of them. If you want to see that video/article just click here. 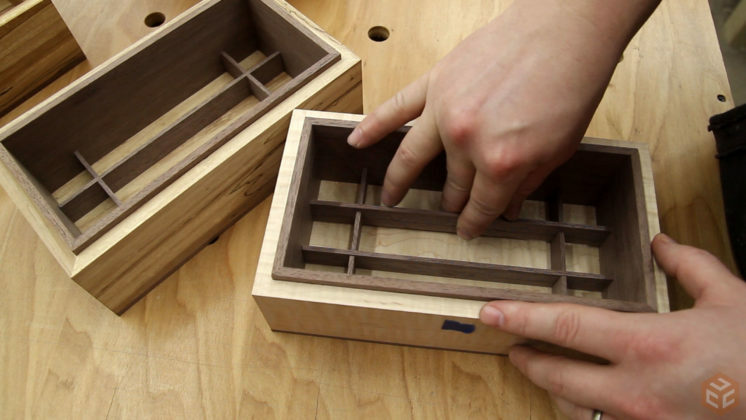 In this video I’ll finish the boxes by making the inside components. 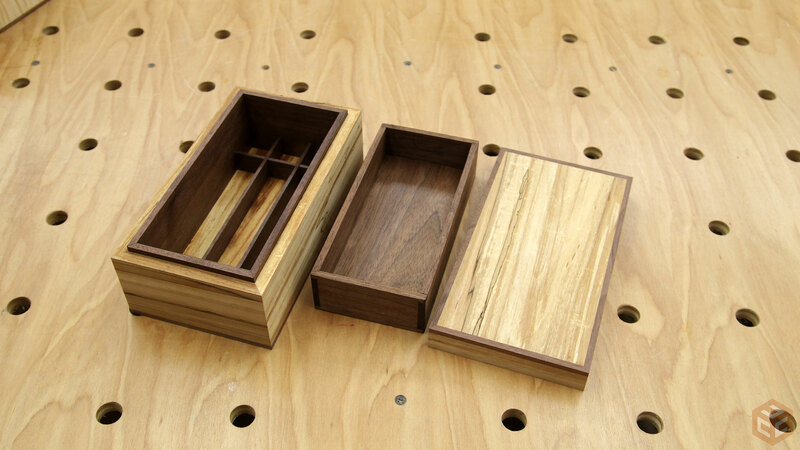 In three of the four boxes I wanted to use walnut for the inside pieces. It will compliment the exterior trim and give a nice contrast when the boxes are opened. To start I resawed a piece of walnut and milled it to the final size which I think was 3/16”. And I cut the pieces slightly long at the miter saw. 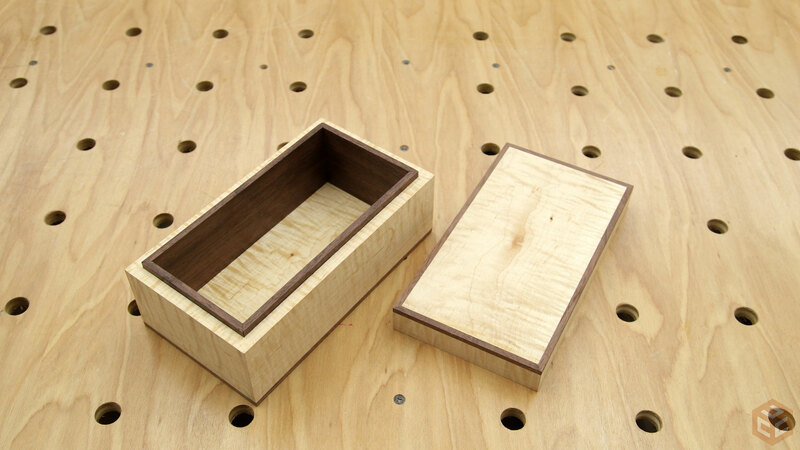 For the two boxes without hinges I wanted to add an internal walnut liner. This is typically done by mitering the joints so that once the pieces are fit to each side they will naturally hold each other in place. To trim the miters I clamped a 45 degree ramp to my shooting board which allows you to really dial in a perfect fit for each piece. I started at one side and just worked my way around. It was my first time using this method and it worked flawlessly. If you haven’t made a shooting board yet I highly recommend you do so. They are incredibly handy even if, like me, you are primarily a power tool user. All you need is any old hand plane. Next up I wanted to make some half lap dividers. 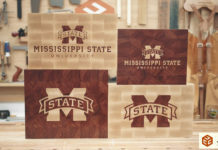 The easiest way I’ve found to make these is to first make a non through cut on a piece of scrap material. 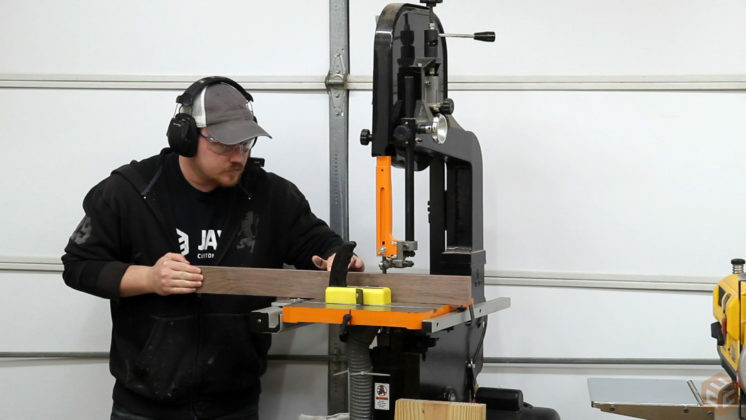 Then you can use that and some more scrap material to determine the fence placement that results in pieces that are a perfect width to fit into the saw kerf. And once you’ve got it dialed in you can rip a few pieces of divider stock. Just like when cutting trim I recommend making more than what you need just in case you mess up later. I used a piece of wood screwed to two miter gauges with a stop block to dial in a good, snug fit for the divider material. I wanted a 3×3 grid in the bottom of the box so that meant two long pieces and two short pieces. Once the pieces were at the appropriate length I stacked them front to back and made a cut about 1” in from the end with the saw blade slightly higher than the halfway height of the pieces. 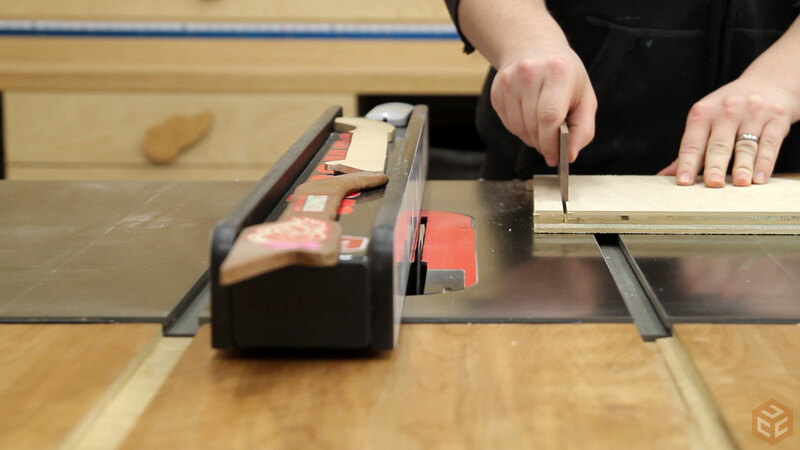 Then all of the pieces can be rotated 180 degrees, lined up with the stop block again, and cut. The resulting grid kinda flows with the overall shape of the box, it’s symmetrical, and has four different size areas. 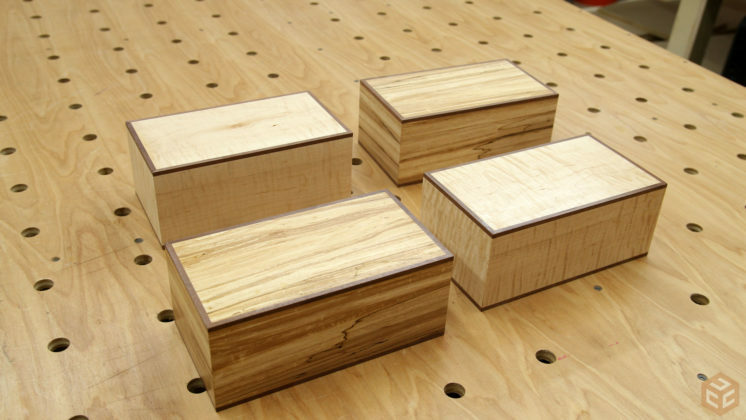 I wanted each box to have a removable tray and my original intentions were to use some offcuts from making the boxes to make a curly maple tray for the curly maple box with hings and the same thing for the spalted maple box with hinges. 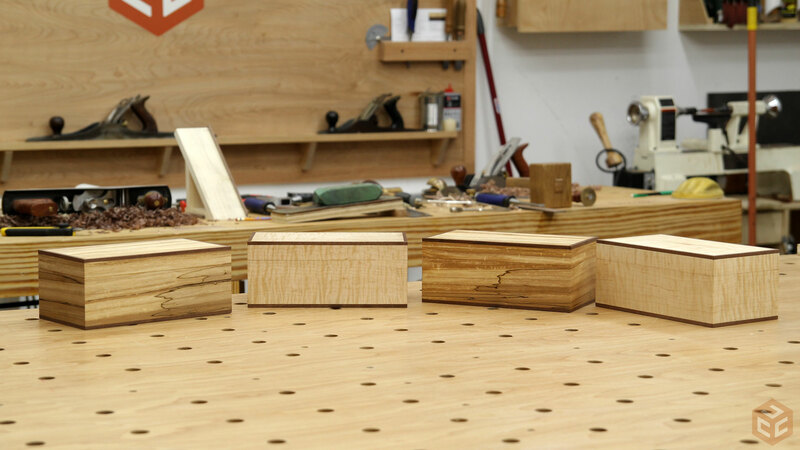 But I didn’t have enough spalted maple scraps so I went with one curly maple tray and three walnut trays instead. 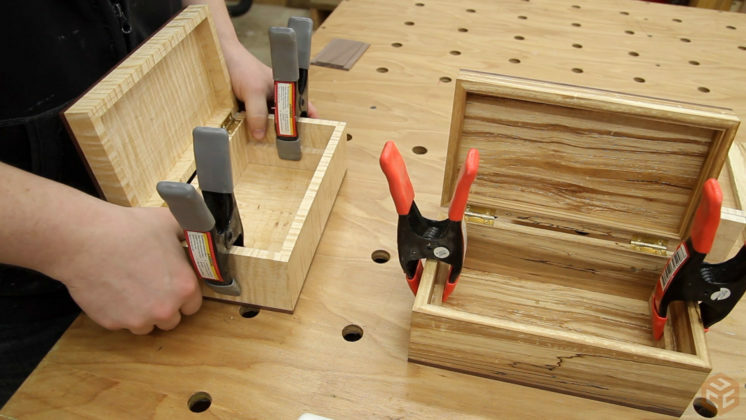 To support the trays in the hinged boxes I cut and glued a pair of blocks to the inside. 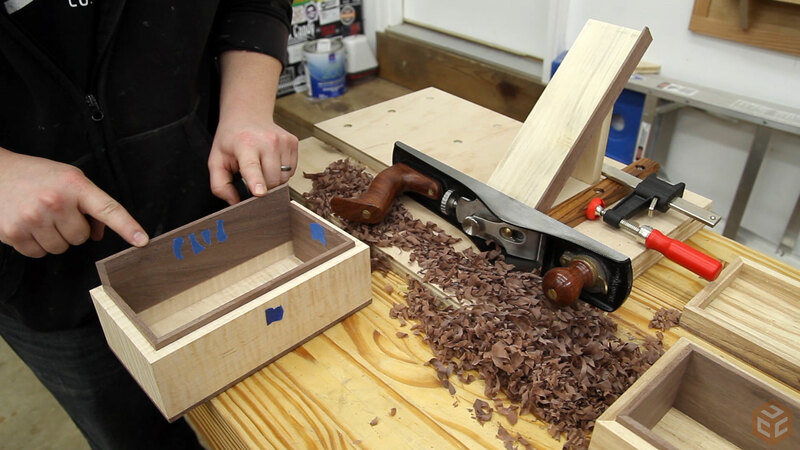 Then it was on to sizing the walnut and curly maple for the tray sides. I resawed them for thickness at the table saw as these were smaller pieces and the table saw leaves a better surface. And then cut them to length just the same way I did the divider pieces. Two short side and two long side pieces for each box. So here’s where I messed up. 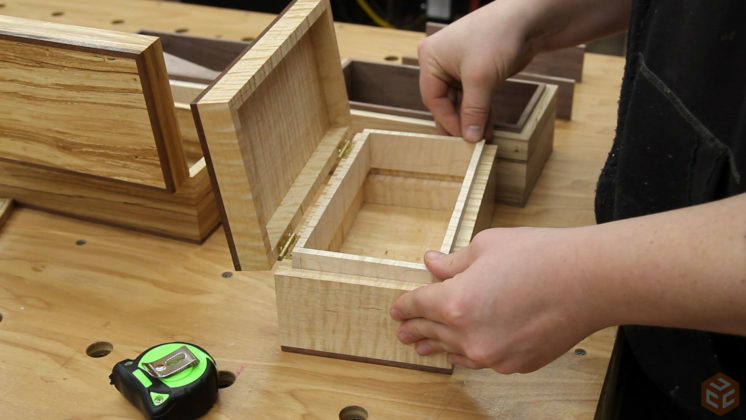 I wanted to use box joints for the tray joinery but after cutting the short side pieces for one of the boxes I really wasn’t happy with the look. The problem is I’m using an alternating tooth angle blade which doesn’t leave a flat bottom groove. I knew the angles would show up at the bottom of the cuts but I didn’t think it would look as bad as it did. I guess when I’ve done this previously on larger material the proportions made the impact of the angles less significant. Because I’m using thin stock it just sticks out like a sore thumb. 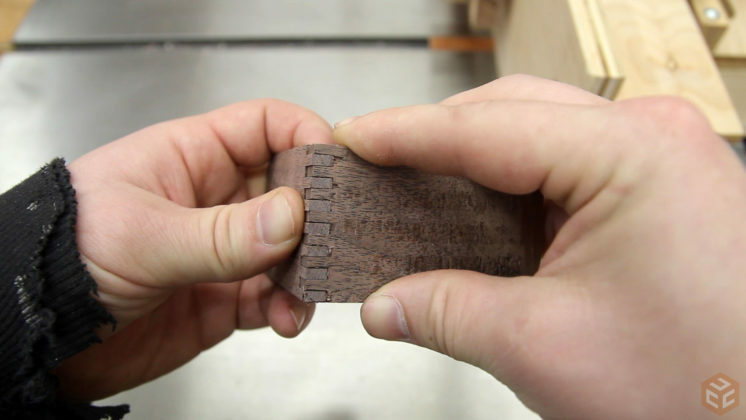 The solution: A flat top grind blade. But I don’t have one at the moment. So instead I chose to cut dovetails. 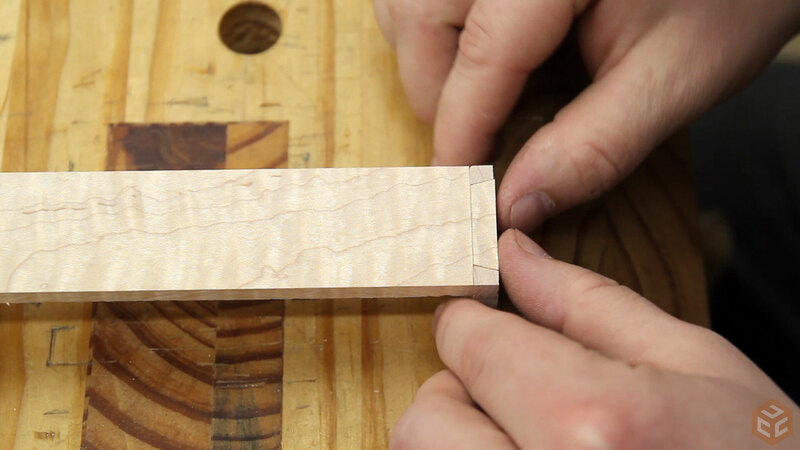 I previously made a video showing a foolproof process for cutting dovetails so I won’t go into great detail here. 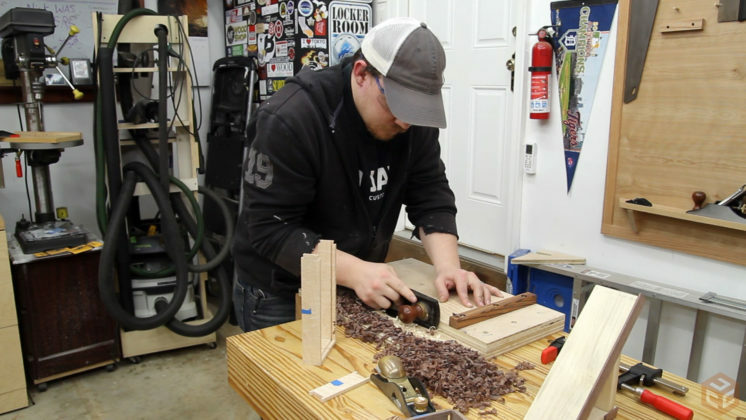 But basically, transfer the thickness onto the tail and pin boards, cut the tails, chisel away the waste material of the tails, transfer the tail geometry to the pin board, cut the pins, use a coping saw to remove the bulk of the waste, chisel away the waste to the marking line, and test the joint. Once one joint is cut you repeat that four times to go around the tray. 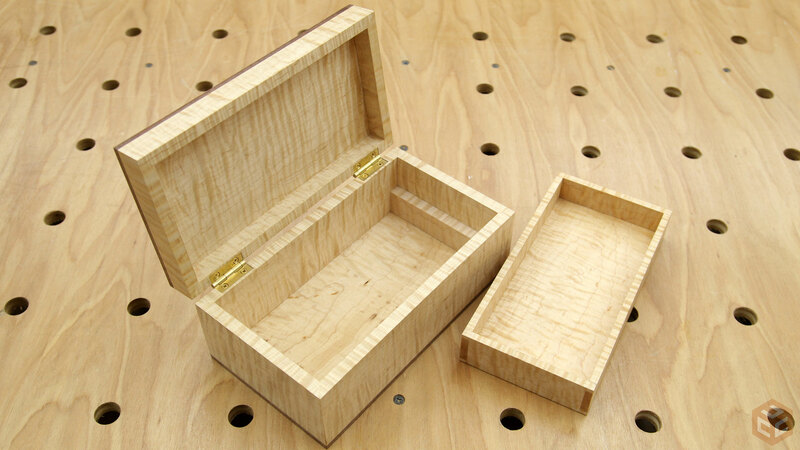 With the joinery cut and the trays dry assembled I was looking for a snug fit into the box. 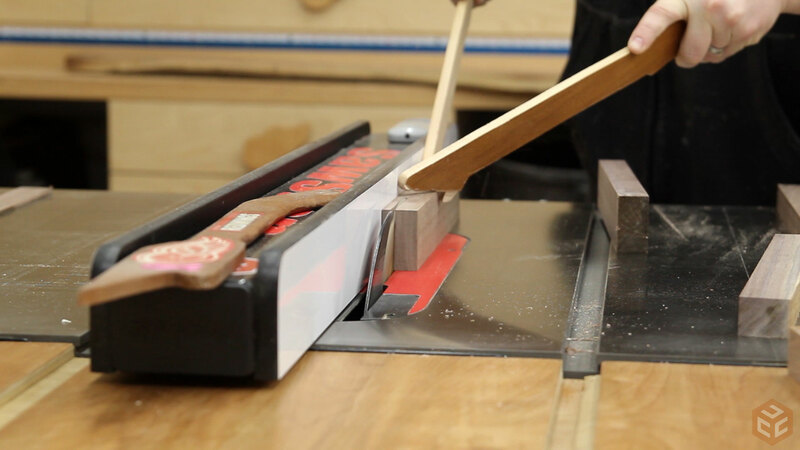 This will ensure that after gluing the tray together I can trim up each side and have a perfect tolerance fit. 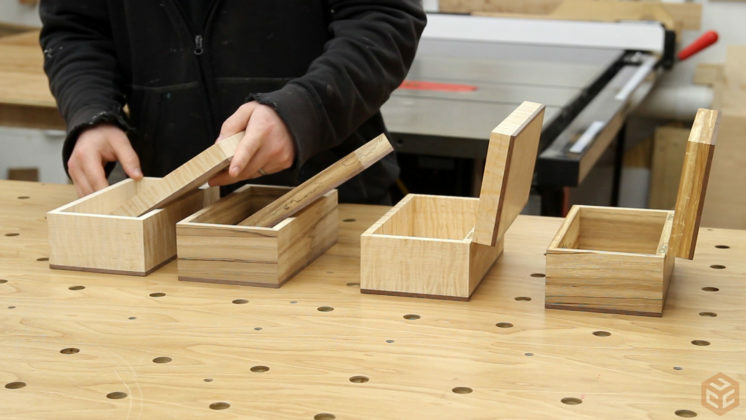 The trays will have a solid wood bottom and to prevent damage from expansion and contraction it needs to be free-floating in a groove. 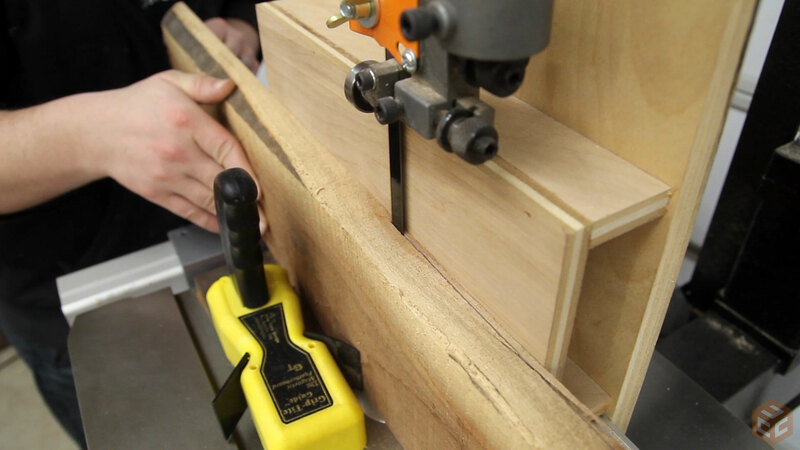 To make the groove I used a single kerf cut at the table saw and positioned the fence so that all of the grooves will be visible on the tail boards and not the pin boards. And as soon as I started taking the first tray apart to cut the groove I immediately got confused as to what side needs the groove so to solve that and prevent any dumb errors on my part I reassembled that tray and put blue tape on the outside and top surfaces of each piece. This way when I cut the groove I just need to make sure the tape is up and out in relation to the table and fence. And here you can see the groove exiting the tail board. This is easy to plug after assembly. For the bottom panels I jointed some matching walnut and curly maple and resawed it at the bandsaw to about 1/8” thick. My plan was to have the jointed face up and have the resawed face down and leave it somewhat rough. Just to give it more of a human made feel rather than it looking 100% manufactured. I rough cut the panels at the miter saw, trimmed them to the appropriate width at the table saw, and then used my shooting board to dial in a perfect length. 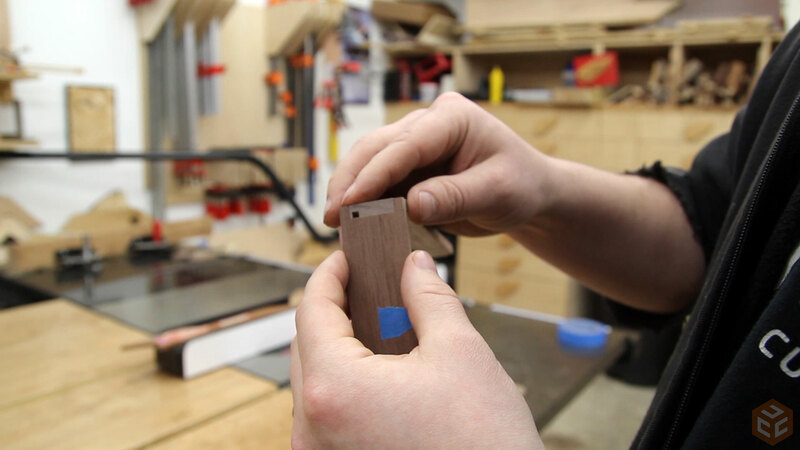 The thickness of the panels was a tiny bit too thick so I beveled the bottom side as needed to make it fit. During assembly I used a small paint brush to apply the glue and made sure to stay closer to the outside to hopefully direct the squeeze out toward the outside and then verified everything was nice and square while in the clamps. Once the trays were dry I sized some scrap pieces to lightly wedge into the tray bottom exit holes and glued them in place. After trimming them flush with a hand saw they nearly disappear. 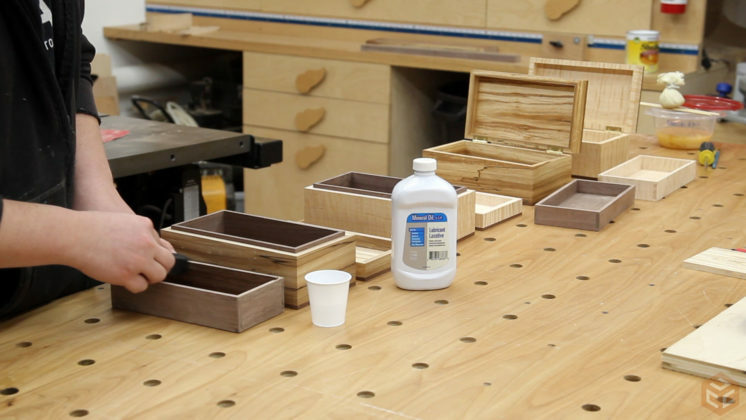 Finally, I used my smoothing plane to clean up the sides of the tray and sneak up on a perfect fit. Not too loose but not tight at all. It should slowly drop in place with gravity. 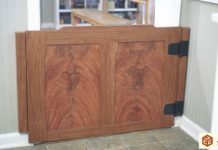 Wood does expand and contract so that is something to take into consideration when fitting something like this. I live in a pretty humid climate so I expect this to shrink more than expand going forward. I didn’t want to go crazy with the finish on these. It’s definitely a “less is more” situation in my opinion. 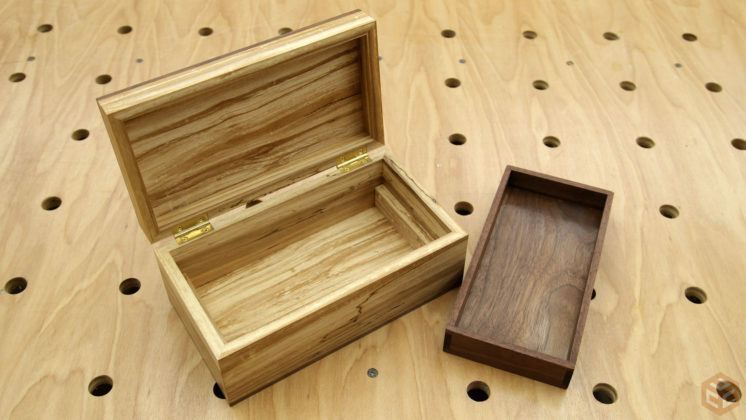 I wanted the natural look of the wood to do all of the talking so on all of the box insides I used a coat of mineral oil which will offer a tiny bit of protection and really make the grain come to life. On the outside I built up a few coats of shellac, sanding with 220 grit before the last coat. 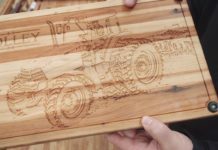 The outsides have a silky smooth surface and the insides have a natural “you’re holding an actual piece of wood” kinda feel to them. Anyway, that’s it for this one. Thanks for watching and have a good day. Fascinating as always! 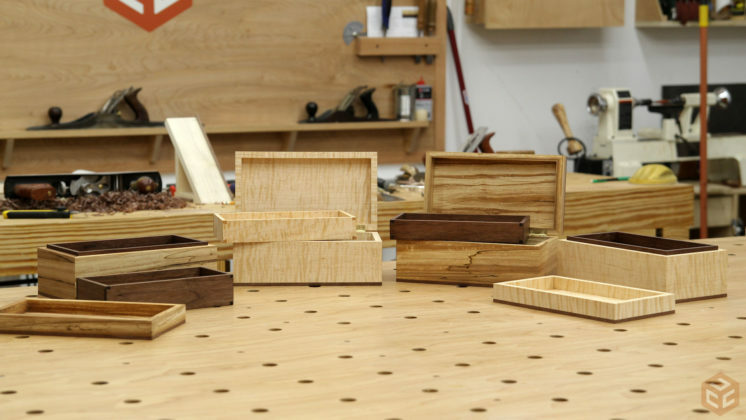 Makes my decision to give top priority to box-making as I learn woodworking even more salient. You are a great example of a fine mentor. Been wanting to give small boxes a try and I think I will. 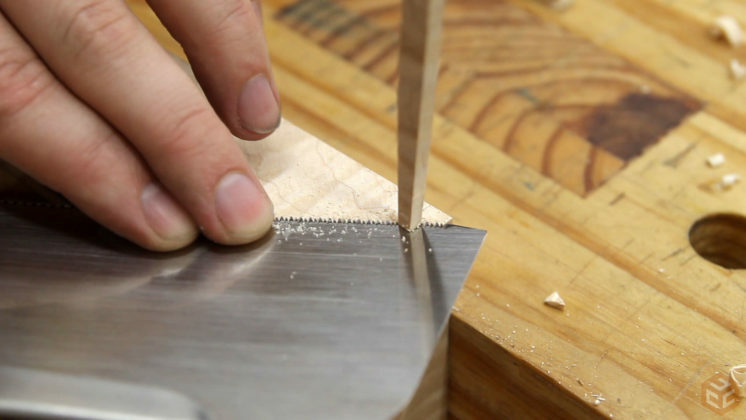 Looks like you are filing a small miter saw blade with a file. Did you comment on that? I didn’t see anything. No matter, always enjoy your stuff, especially the weekend review of the web! I’m not sure I understand what you’re talking about. Filing a saw blade? Again, A nice job. No. A great job. Pleasure to watch you work. an amazing work! Thank you very much for explaining the whole process.